Every so often I come across a piece of clothing that really speaks to who I am. 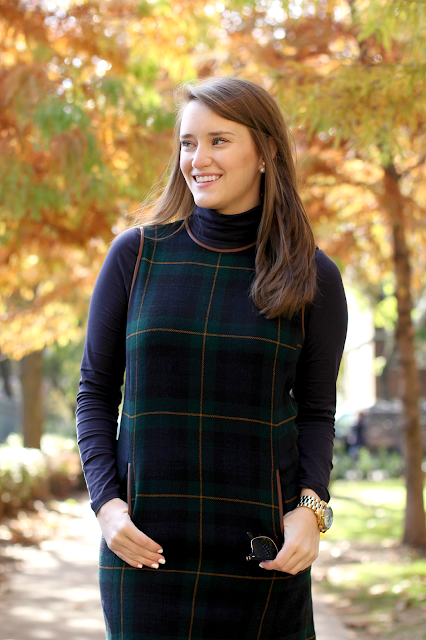 I found this dress the other week when I was rounding up my favorite black watch plaid items. The moment I saw it, I knew it had to be mine! I do have to admit that I stole the look from the model. 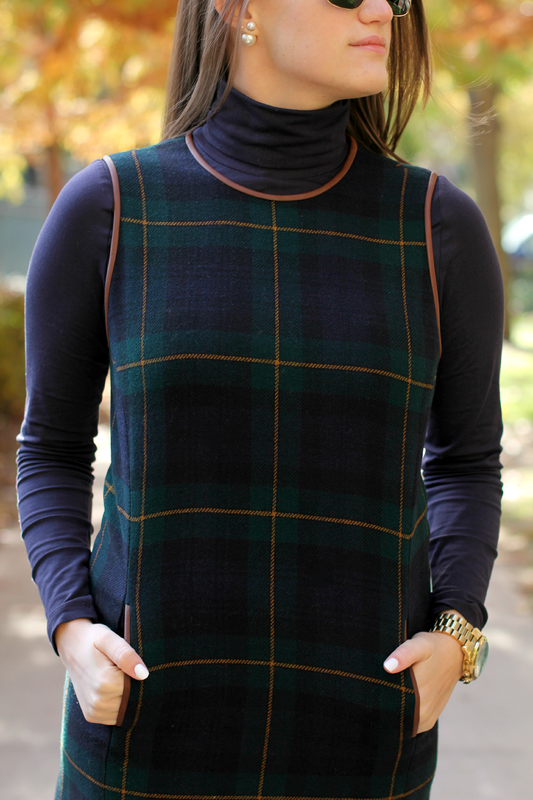 I had a navy turtleneck in my closet and thought it would be the perfect time to break it out and so I did. This is my ideal fall look with the shift plaid dress, the turtleneck and riding boots. 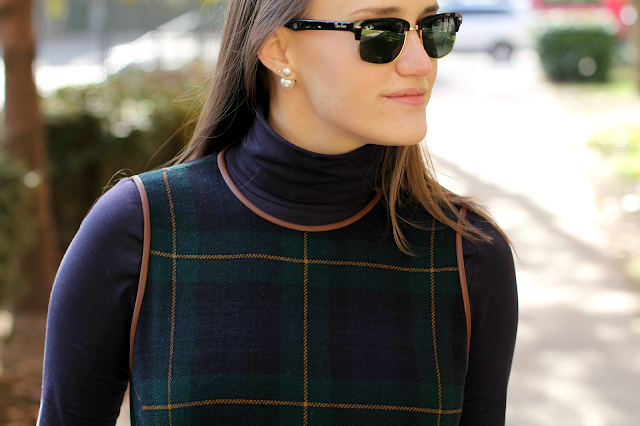 It's uber preppy, very conservative and perfect for a slew of occasions. This is a perfect Thanksgiving look for the holiday and I can't wait to find time to wear this dress again and again. 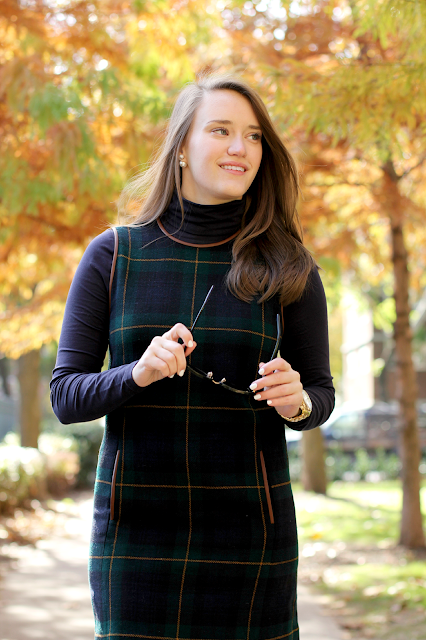 When it gets colder, it's also super easy to pair with tights! 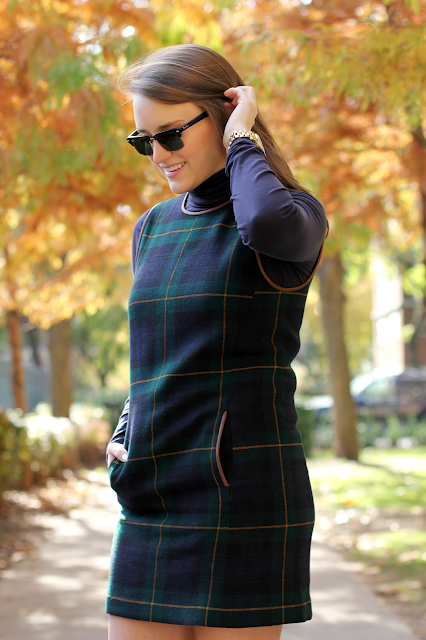 I absolutely LOVE that plaid dress with the turtleneck underneath! And the classic Ray Bans and the fun 360 earrings add such fun pops! Gorgeous look! I love that dress! Looks great on you! I could never pull that off but it looks great on you! Love this look! That dress is phenomenal! That dress is adorable! LOVE! I can't get enough of this dress! Wish they had it in my size. Did you see the links for Dillards and Macys? They have more sizes!! Yes! I'm normally a 6 and I'm returning it for an 8! Ah, good to know! Thanks so much! I've had my eye on this dress for a while. 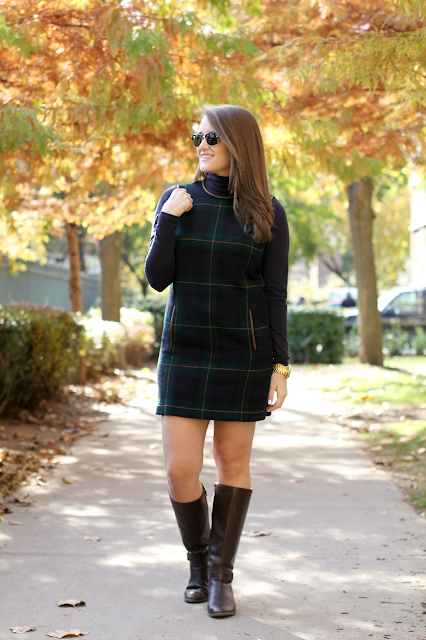 I like the boots you paired with it better than the model's boots, your outfit is just all around more preppy. Too cute!